Chris Dahlgren is a New York native now living in Berlin. He has developed a unique style in both playing and composition. This may be a result of his many musical partnerships with the likes of Anthony Braxton, Dave Holland, Fred Hersch and La Monte Young to name just a few. While his compositional style is more abstract, Dahlgren's playing is very contemporary in a vein of Dave Holand and Charlie Haden. This I feel allows his fellow band members to express themselves freely within the written material. Dahlgren has been performing since the eighties (with his debut as leader appearing in the late nineties) but recently he put together a quintet with members that he has played together in various forms, now called Lexicon. Their debut, Mystic Maze (Jazzwerkstatt Records) is a brilliant slice of improvisation, classical theory and poetry. Mystic Maze is based around the music of the great composer Bela Bartok, or better yet the critics who derided Bartok during his time for the adventurous and original spirit that he was. Dahlgren has constructed a poetic operatic experience that moves freely between melodic Silent Way-esque motifs, explorations on the meaning of music and how we and civilization relate to it. 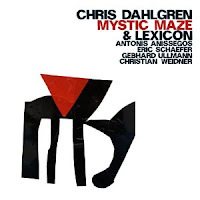 The title track, "Mystic Maze" begins with almost Beat Generation drum and bass lines matched by Dahlgrens poetic delivery, outlines the direction of this session as journey of meaning of Bartok and his music. This is free form but with meaning and purpose. Dahlgren utilizes the direct critiques of Bartok as lyrics in a poetic fashion throughout Mystic Maze. "Painless Dentistry No.1 - 3" while have more a jazz improvisational element due contain the underline feeling of angst that was delivered upon Bartok. This is most evident on "Painless Dentristy No.2" which Dahlgren recites a critics thoughts on how more or less Bartok has lost his way and his vision. The delivery of the lyrics and mastery of the musicians within this format is extraordinary. The work of both Ullmann, Weidner (on clarinet and sax) and Anissegos exploratory vision on piano are marvelous throughout each piece. "The Composer Promenading The Keyboard In His Boots" is another moment in which the material shines not only due to Dahlgren's arrangements but the effortless phrasing from Anissegos, Weidner, Ullmann and Schaefer's perfect timing. "The Composer Promenading..." has a critics discussing the meandering and meaninglessness of Bartok's written material. Under the direction of Dahlgren this diatribe is turned on its head beautifully. Mystic Maze is work that is reminiscent of an evening at St. Marks Church listening to Allen Ginsberg in the eighties. Or if some of you may remember an album by Heiner Gobbels entitled Man In The Elevator (ECM Records) which beautifully balanced jazz improvisation, operatic themes and poetic parameters. Mystic Maze is heavy but delightful stuff and worth repeated listens so you can gain every drop of knowledge from the world Dahlgren has constructed. ...And then you should go out and purchase some Bartok if you don't have some already.